One of the main components of JV LLC «Sakhalin-Shelf-Service» policy is responsible attitude towards environment. JV LLC “Sakhalin-Shelf-Service” conducts its activity based on requirements of actual Environmental Law. To observe this, all company’s activities are done in accordance with Quality and Environment Management System. " JV LLC «Sakhalin-Shelf-Service» has accumulated significant experience in treatment of waste, generated as a result of oil and gas exploration, including drill cuttings. In 2000 the company was one of the first on Sakhalin, which obtained the license on collection, utilization, neutralization, transportation and disposal of I-V hazardous class waste and organized acceptance of waste, generated as a result of shelf project operators’ activity. In 2004, Environment Management System of JV LLC “Sakhalin-Shelf-Service” was the first one, certified by Gosstandart of Russian Federation based on international standard ISO 14001-96 IQ-Net and GOST of Russia. Company’s activity is marked by diploma of “Sakhalin Energy Investment Company Ltd”,”Sakhalin-2” project operator for accident-free operation and reduction of environmental impact. Today JV LLC «Sakhalin-Shelf-Service» has obtained all licenses which allow executing any kinds of work (construction, transportation, storage, customs, production and consumption waste treatment). Besides, since 2001 JV LLC «Sakhalin-Shelf-Service» has been accepting waste from the companies, located on the territory of Sakhalin region, including those, involved in medical care, education, culture as well as municipal companies. The company has developed activities, aimed at minimizing and prevention of emergency situations, related to hazardous waste treatment, as well as elimination of such emergency situations consequence, if they occur. 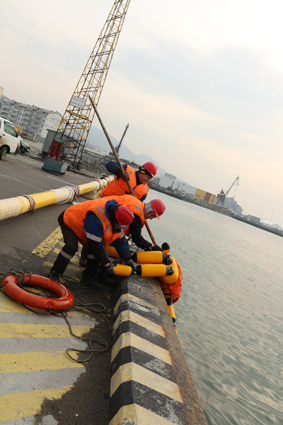 JV LLC «Sakhalin-Shelf-Service» chooses flexible approach to major HSE issues solution. Quality plan is developed for every project the company is involved in and approved with the client. By following environment protection activities in performing waste treatment and HSE Law, JV LLC «Sakhalin-Shelf-Service» makes significant contribution into improvement of environmental safety level and protection of Russian Federation natural resources.